MormonInfo.org - FAQs - Doesn't the "us" of Genesis 1:26 refer to other Gods? There are other options in understanding the term "us" in Genesis 1:26, so LDS cannot simply assume that their view of this is the only one. LDS think the "us" must refer to the Gods within the Godhead. On the other hand, the two most plausible views are 1) the "us" here could either refer to God having a plurality of majesty (similar to a king asking, "Who shall go for us?" in reference to simply himself), or 2) it could refer to the other members that comprise the Being of God. The latter would refer to the Christian doctrine of the Trinity (for how exactly this is different from Mormonism and Modalism, see my comments on "How can Jesus be one Being with the Father when Jesus prays to the Father?"). So just because the term "us" is used here in and of itself is no reason to think the term is referring to "Gods." And then the Lord said: Let us go down. And they went down at the beginning, and they that is the Gods, organized and formed the heavens and the earth. ...And the Gods took counsel among themselves and said: Let us go down and form man in our image, after our likeness;... So the Gods went down to organize man in their own image, in the image of the Gods to form they him, male and female to form they them (The Book of Abraham 4:1, 26-7). If this were the case, why didn't Smith translate it that way in his Inspired Version? There it is translated "God" all the way through. Further, all the versions of the Genesis creation account translate it that way, and they translate it that way because Hebrew scholars know that the term "eloheim" depends on the context and the verb usage associated with it. The verbs "created" (bara) and "make" (asa) throughout these opening chapters of Genesis are third person singular verbs when they have eloheim as their subject. If they were plural verbs under this condition, then the term "eloheim" would be malleable enough to read "gods." Also, the further context of Isaiah 40:12-28, 43:10, 44:6, 8 and 24 (among other Isaiah passages) would clearly indicate that God creates everything outside of Himself. That is, He creates alone. At this point certain LDS claim that the term "God" is a flexible term that can also mean "the Godhead" (see e.g. Blake Ostler's review of Francis J. Beckwith and Stephen E. Parrish's The Mormon Concept of God in Farms Review of Books, Vol. 8, Num. 2 , 136-143). 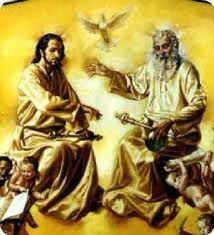 This term refers to the team of separate Gods (Father, Son, and Holy Spirit) who rule over the universe. (The "universe" for LDS simply means everything that God creates and rules over; it does not mean that God creates and rules over literally everything outside Himself. God did not create matter and intelligences, for example, since these are eternal [D&C 93:29-35 and Abraham 3:18-28]. God does not rule over His Father's world, for example, since it was created and is ruled over by its God.) For these LDS, the term "God" is similar to the term "Israel." The latter can either refer to Jacob, or it can refer to the nation. In the latter case, the pronouns "I" and "He" may still be used in reference to it (e.g., Numbers 21:2 and Psalm 25:22). So if "Israel" is a group of separate individuals (Israelites) who are unified in some way other than in their being and "Israel" can use these pronouns in reference to itself, then the argument goes, "Why can't we understand the term 'God' in a similar way?" The LDS view would prima facie seem to be consistent. But there are at least a couple basic problems. The first problem is that a good case can be made from Gen. 1:1 that when "God created the heaven and the earth" this "is a merism signifying 'the totality of cosmic phenomena' [and this] points us toward an absolute beginning of the universe--including matter" (Paul Copan and William Lane Craig, The New Mormon Challenge, Francis J. Beckwith, Carl Mosser, and Paul Owen, eds. [Grand Rapids, MI: Zondervan, 2002], 111). If this is the case, then "everything that exists is totally dependent on God for its being" (O. Kendall White cited by Copan and Craig, 106). Now LDS will ask, "Even if this is true, why can't the term 'God' still be understood as the term 'Israel' was shown above?" That is, when the term "God" is used here, why not think of that as "the Godhead" in LDS categories? The problem is the general LDS understanding of all Gods having to progress in becoming Gods for particular worlds ("general", since there is a possibility LDS Scriptures may in fact allow "creation ex nihilo" [creation out of nothing] even when LDS prophets have taught otherwise [see Copan and Craig, 99-107], and because a handful of LDS like Ostler hold to one God who contingently did not have to progress). Progression to godhood in standard LDS categories, though, presupposes matter and time. Even the God of our world needed matter and time in order to become a God. But this would be impossible if creation ex nihilo is true. In such a case, one would have at least a non-LDS Social Trinitarianism--a functional monotheism, which treats the Creator as a collective substance of multiple persons who are also substances, each of whom is dependent on the others for their existence as God (for more on the versions of the Trinity, see J. P. Moreland and William Lane Craig, Philosophical Foundations for a Christian Worldview [Downers Grove, IL: IVP, 2003], 575-96). The final problem with understanding the term "God" in Genesis as a "Godhead of Gods" is that Genesis is not all we have. The LDS position still seems to suffer at the hands of, among other things, 1) other biblical passages such as those in Isaiah and 2) other LDS scriptures. As for the Isaiah passages, Jehovah ("the LORD") is speaking there. LDS typically limit the term "Jehovah" to the Lord Jesus. In reference to the term "Jehovah," the LDS Bible Dictionary says, "Jehovah is the premortal Jesus Christ." Jesus is a person; He is not a team, viz., the Godhead. He is part of the Godhead. If this is true, then why doesn't Jesus know about the Father as another God instructing Him and ruling with Him within the Godhead? Why doesn't Jesus know of the Father as another God "formed" before the Son, particularly since Smith taught that all Gods had to grow up to become Gods? Jesus does not even know of the Holy Spirit (cf. Gen. 1:2) as another God who was involved in creation. Traditional Christianity on the other hand doesn't have a problem here since it does not limit the term "Jehovah" to simply Jesus. "Jehovah" refers to the Father, Son, and Holy Spirit (e.g., Deuteronomy 6:4: Jehovah our Elohim is one Jehovah). Each Person is distinct from the other, and yet They as the Godhead are inseparably united in the only Being of Jehovah in existence. Hence, there is no problem if They also use the term "us" in reference to Themselves. The LDS position also may suffer at the hands of their own inconsistent scriptures, which clearly speak of God in terms of "the only living and true God, and that he should be the only being whom they should worship" (D&C 20:19; also cf. Alma 11:24-29). The only living and true God is a being, not a Godhead or team. Let that sink in for a moment. Further, "He" a God who "is unchangeable from all eternity to all eternity" (Moroni 8:18). That is the Being that Christians worship--Father, Son, and Holy Spirit--as the only God in existence. The LDS being that they worship above all is simply the Father. Nonetheless, LDS recognize Him as one God Being in the Godhead or team of "living and true" God Beings, and thus contradict the aforementioned LDS scriptures.